In much of the U.S., if you want to build a lift kit for your truck out of rusty junkyard parts, you can. But in Australia, things are different. The country has strict rules on vehicle modifications, and now police are seizing jacked-up trucks and fining drivers as part of “Operation Lift,” Australia’s 7 News Gold Coast reports. There are few modifications that ruin a vehicle as thoroughly as lift kits and big tires do. Braking, handling, ride quality, acceleration (if you don’t re-gear), and rollover safety all go down the toilet, with the only real benefits being off-road capability and aesthetics. I know all this, because I’ve lifted multiple vehicles, and I regret having done it to my daily driver. (I do not regret having lifted my off-road rig, however). The aforementioned performance detriments are part of the reason why Australian police officers near Gold Coast are cracking down on trucks and SUVs with unapproved lift kits. In the video above, a policeman explains that his team is on the hunt for vehicles with raised bodies, modified suspensions, and non-stock wheels. Those “defects” can change the way trucks handle or brake, he says, and that can put drivers at risk. 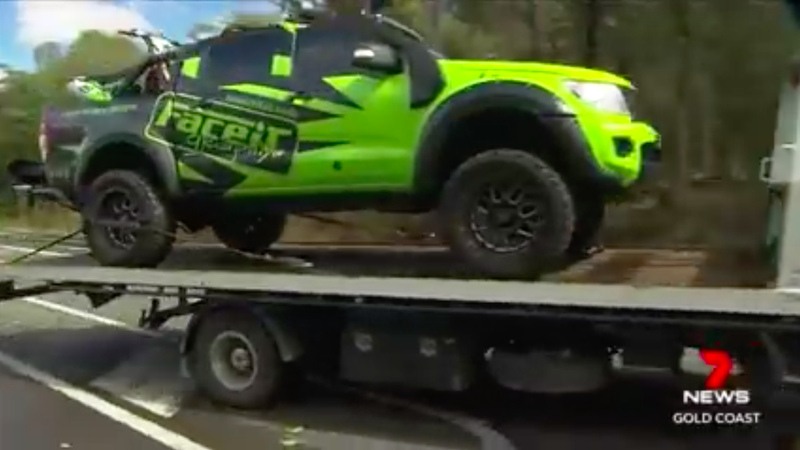 The video also shows a green Ford Ranger being towed away, and its owner telling 7 News that he’s driven the modified vehicle for five years, and it’s never given him any issues, nor has it felt unsafe. In the second video shown above, an officer specifically addresses the green Ranger, saying it had an aftermarket suspension, a body lift, and oversized tires. “The vehicle as it stood on the road was above and beyond what can be approved under the mod plate scheme, and no approval had been given from Queensland transport,” he said. The driver received one demerit point, a $130 AUD (roughly $93 USD) fine for driving a “defective” vehicle, and a $391 AUD (roughly $278 USD) fine for driving a vehicle with unapproved mods. The officer says that his team is not worried about shoddy mechanics, it’s mostly concerned about the modifications being unapproved, and therefore possibly unsafe. He says the raised ride height can put people driving smaller cars in jeopardy during a collision, the lifted truck’s headlights could also be aimed too high, and the higher center of mass increases the rollover risk. The other officer in the video says the reason why police have gathered in the southeast Queensland area is to get training on vehicle modifications, whose legality is set by a National Code of Practice. You can find Australia’s National Code of Practice here, though Queensland’s own Code of Practice is a little bit different. Queensland’s Code of Practice only allows for vehicles to be lifted up to above five inches above stock ride height. A vehicle lift under about three inches that is achieved solely through suspension and tire modification does not require any sort of certification, but lifts between about three and five inches do. Among the requirements that must be met by a lifted vehicle are Australia Design Requirements, called ADRs, which are shown in the table above, and include include lighting performance, braking performance, and speedometer functionality. Other lift-related rules set by the Code of Practice include overall suspension travel in either direction that must remain “at least equivalent to two third of that originally available” prior to the modification, a body-block maximum height of two inches, a suspension lift maximum of two inches, a maximum increase in tire diameter of two inches, and a maximum tire width of 50 percent wider than the widest rubber available from the manufacturer. Not to mention, vehicles that have been lifted more than about three inches must pass a Lane Change Test, illustrated above, conducted at roughly 60 mph. Clearly, Australia’s rules on lifting vehicles are rather strict. And though that may seem silly to us the U.S., in other parts of the world (like Germany), every single major vehicle modification has to be approved for safety by government officials, and drivers have to carry a book of proof in their vehicles at all times in case they’re pulled over. So it’s safe to say that we’ve got it good in the U.S., because we don’t have to deal with these admittedly totally logical, but supremely lame rules on truck lift kits.